The Indian Textiles Industry has an overwhelming presence in the economic life of the country. Textiles sector contributes 14% of industrial production, 4% of GDP and 10.63% of country�s export earnings. It provides direct employment to over 35 million people, which includes a substantial number of SC/ ST, and women. 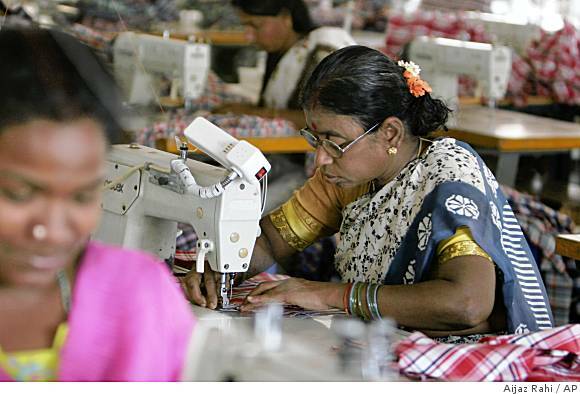 The Textiles sector is the second largest provider of employment after agriculture. Indian Textiles industry was growing at 3-4% in the last 6 decades. Under 11th Five Year Plan (FYP) it was projected to accelerate to a growth rate of 16% in value and should reach the value of USD 115 billion (exports USD 55 billion and domestic market USD 60 billion) by 2012. Exports are likely to reach USD 32 billion in 2011-12 and domestic market USD 55 billion. Technology Upgradation Fund Scheme (TUFS): Government has enhanced the 11th Five Year Plan allocation for TUFS from Rs. 8000 core to Rs. 15,404 crore. TUFS has helped catalyse an investment of Rs. 2 lakh crore since its inception. The additional allocation is expected to catalyse an additional investment of Rs. 46,900 crore. E-Marketing: The e-marketing platforms have been developed by the Central Cottage Industries Corporation of India (CCIC), and the Handicrafts and Handlooms Export Corporation of India (HHEC). National Fibre Policy: The Draft fibre policy has been finalised and placed in the public domain. Marketing Initiatives: Niche handloom and handicraft products were given a marketing platform through 600 events all over the country. These generated a business of over Rs. 350 crore. National Textiles Corporation: NTC has modernised 17 mills. New Marketing initiative include new branding drive with new logo. Skill Development: Scheme on Integrated Skill Development Scheme targets to to train approximately 26.75 Lakhs persons over a period of 5 years (2.70 Lakhs persons in first two years); cover all segments under the ambit of the Ministry including: Textiles and Apparel; Handicrafts; Handlooms; Jute; and Sericulture. Scheme proposed for implementation under the 12th FYP with allocation of Rs. 3500 Cr. A target of 1.5 lac workers would be achieved by March 2012.
Credit Linkages: 25,000 Artisan Credit Cards have been issued to artisans under the Credit Guarantee Scheme, over 1,65 lakh additional applications have been forwarded to banks for consideration. Welfare Schemes: Under Handloom Weavers� Comprehensive Welfare Scheme, 16,11 lakh weavers and ancillary workers were given health insurance coverage and 5-10 lakh life insurance coverage. Under the Rajiv Gandhi Shilpi Swasthya Bima Yojna, 7.33 lakh artisans were given health coverage. Financial package for handloom sector for waiver of overdue loans. During the Budget speech of 2011-12, the Finance Minister had announced that the Government of India would provide Rs 3000 crore for implementing the financial package for handloom sector for waiver of overdue loans. The Financial Package has been approved by the Government with an outlay of Rs. 3884 crore. This includes onetime waiver of overdue loans and interests as on 31st March, 2010, for loans disbursed to handloom sector. The Financial Package is expected to benefit about 3 lakh individual handloom weavers and 15000 cooperative societies, and they will be able to access institutional credit once again. (ii) Yarn supply to handloom sector: To address the issue of yarn availability at reasonable prices 10% price subsidy on silk and cotton hank yarn will be provided by the Government and enhancement of the freight reimbursement for transportation of different types of yarn used by the handloom sector in order to offset the increase in fuel cost. The projected financial outlay involved in the implementation of the comprehensive package during the current year and the 12th Plan period is Rs. 2362.15 crore. The entire funding will be provided by the Government of India. The Third All India Handloom Census (initiated in 2009-10) has been successfully completed. It is ascertained in the Census that nearly 43.31 lakh identify cards (PICs) to all of the handloom weaving and its ancillary activities. Government has issued Photo identity cards (PICs) to all of them. The Schemes of the Government of India have played an important role in support and preservation of traditional skills and to facilitate the market linkage for the benefit of the handloom weavers. In addition, 20 Pilot Projects are successfully running in major handloom states all over the country. 541 clusters and 1788 Group Approach Projects have also been developed. A budgetary support of Rs. 2.55 crore has been released to provide the weavers with margin money during the year 2010-11. Each weaver is provided with Rs. 6000 as margin money. To protect the distinctive identify of handloom products the Handloom Mark and Geographical indication (GI) registration has been provided to traditional handloom products from specific regions. Government has sanctioned 21 new Textiles Parks under the Scheme for Integrated Textiles Parks with a project cost of Rs. 2100 crores to be implemented over a period of 36 months. The new Textiles Parks would leverage an investment of over Rs. 9000 crores and provide employment to 4 lac textiles workers. Government sought to ensure balanced regional development, promote textiles industry in North Eastern States and in States where the industry is in a nascent stage of development and promote textiles parks in cooperative & handloom sectors. The product mix in these parks would include apparels and garments parks, hosiery parks, silk parks, processing parks, technical textiles including medical textiles, carpet parks, powerloom parks. � A production value of Rs. 786 crore against Rs. 541 crore in the last year, showing an increase of 45 per cent. � Sales turnover has gone up by 39 per cent from Rs. 487 crore to Rs. 675 crore. � The net profit, including income derived out of sale assets, stands at Rs. 1,366 crore up from Rs. 103 crore. � As of March 1, 2011 the total sale of assets was concluded at Rs. 6317 crore, of which Rs 2,011 crore were realised during the year. � New brand RAASA was launched by the company in September 2010, for homeware products. � The first ever e-auction was conducted in July 2010. So far, the company has concluded 10 e-auctions. � NTC has modernised 17 mills.